The following is the Letter from the Editor for the Spring 2019 issue of Exponent II. You can subscribe to a digital or print copy at our store. Subscribe by April 15. Cover artwork is by Kwani Povi Winder. You can view more of her incredible work here. As a member of the Relief Society presidency in my ward, I’ve put a lot of thought recently into how to create a safe community. I live in an American college town, and my ward is pretty unorthodox. Graduate school transplants from the inter-mountain West sometimes struggle to adjust to a culture that is more open to doubt and embracing of diversity than what they have previously known. Making space for everyone is challenging. Striking a balance between those who want simple, faith-affirming, easily-digestible lessons and those who want to wrestle with scripture and share their struggles can be difficult. Add in that we are striving for honesty, vulnerability, and unmoderated dialogue, and it can feel impossible. Can we really make this tent wide enough for everyone who wants to be there? The Exponent II Facebook page is facing some of the same questions. Our group has grown rapidly over the last couple of years, and it attracts Mormons from across the spectrum of belief, cultures, age, gender identity, and just about any other demographic. Some women have left the Church and feel strongly about the harm they experienced. Some are active and believing. Many are new to feminism and are struggling with concepts of intersectional feminism, such as facing their own privilege, while feeling new to exercising their own voice. It’s a big, sometimes messy, cacophony of voices and the moderators of the group have not always felt like it was possible to sustain a space where people felt safe to express vulnerability but were also challenged to grow. While we didn’t plan on a theme for this issue, the unifying thread, for me, became about community and how communities can either support or harm the individuals within them. In “Flawed Beliefs and Abuse,” author Celeste LaFollette explores how a theology that consistently privileges mercy over justice can teach survivors that they should not hold abusers accountable. Marianne Pond reflects on her circle of friends that support her as she faces a terrifying diagnosis in “I See the Stars”. In “Home” and “Exit Strategy,” Laura Root and Cara Evanson question where they belong in their ward communities, as Laura makes space for herself as a queer, active-yet-excommunicated LDS woman and Cara faces the peculiar ritual of leaving a singles ward unmarried. Family communities are particularly complex and full of potential harm or help. Christina Taber-Kewene describes a lifetime of seeking connection with her mother in “The Love of Our Imperfect Mothers.” In the fascinating short story “Meeting the Wife,” Mette Ivie Harrison imagines a relationship between two women–the deceased and dying wives of one man. The heartbreaking “#metoo” speaks to the damage that sexual abuse from a family member can do to a young woman. And in “California Adventures,” Joanne LaFleur explores a personal faith crisis in the context of marriage and motherhood. 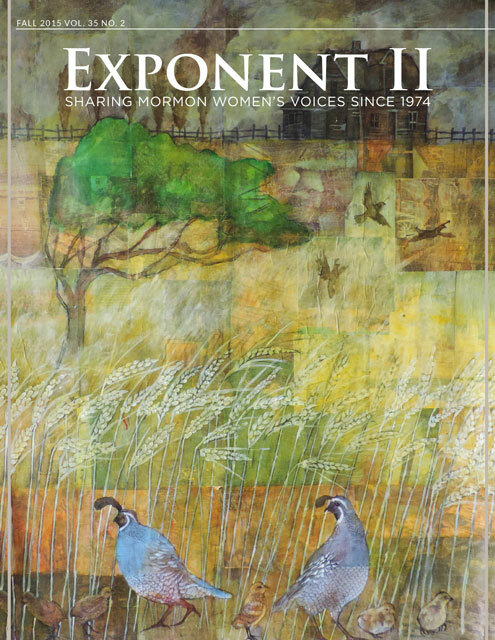 I believe that this issue of Exponent II in particular, and the organization of Exponent II in general, holds one of the key answers for building open, inclusive, diverse communities: tell your story, and listen to the stories of others. Speak from your own lived reality. Hold space for others to share divergent experiences. Be willing to sit with discomfort or to rejoice in others’ victories. There is unparalleled beauty in a space that practices deep dialogue and offers genuine solace and celebration, a true offering of charity for all who come to speak and listen. To read this issue, go to the Exponent II store. I love that all your letters from the editor read like essays. You have many gifts and writing is certainly one of them.